Characterization drives Stagecoach, incredibly well-rounded, developed, and interesting plays on the Western stereotypes. Each of these people, riding together on a stagecoach to another town, are distinct. It may be their hatred for one another, their social status separating them, or a criminal past. It’s so much more than a tale of Indians on a rampage, Geronimo patrolling the land looking for the slaughter as the group passes through. It’s humor, drama, romance, and action, that perfect blend of Hollywood genres that brought to life these early productions, and still carries through to this day. 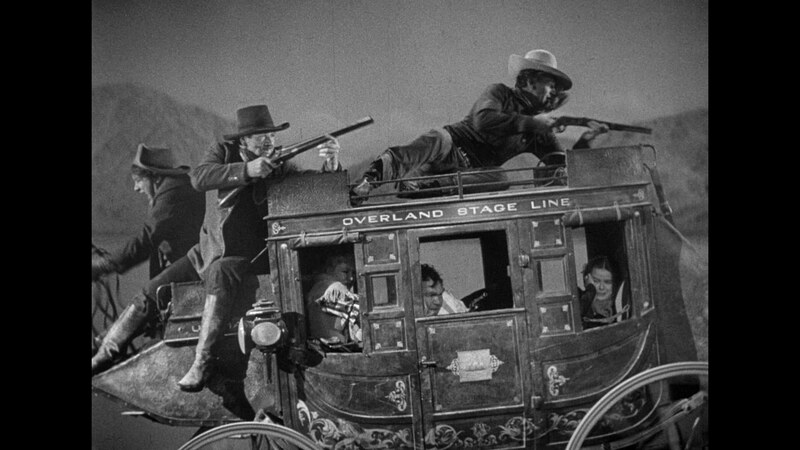 It’s not fair to look back and simply state Stagecoach was merely influential. Certainly, it was, launching the Western career of John Wayne, and pushing director John Ford into a spotlight as one of the greatest directors. Statements like “influential” and “ahead of its time” date the picture, unfair and even a little misguided. With the immense level of detail at work here, the stunning vistas and jaw-dropping stunt work of Yakima Canutt, Stagecoach is only dated in its typically static direction. The performances, bringing these archetypes back to life and with their own personal goals, is something Hollywood long forgot how to do. Ford loved the locations he was given, Monument Valley used multiple times simply for its beauty, even if doesn’t seem to make much sense to pass the area repeatedly. The sheer scale of it all keeps the adventure alive, even if the destination never seems to come into view, and the action… spectacular. Yakima Canutt performs what is easily one of the more famous stunts in film history here, Steven Spielberg taking note and utilizing it in Indiana Jones decades later. Chased by Indians, Yakima jumps from horse to horse while they’re completely on the run to snag a loose harness, this while motion elevates the tension in the background. It’s the guts and bravery that brought old Hollywood to life, captured here with almost no regard for personal safety. Immediately striking when viewing this AVC encode is the damage that permeates every frame. The level of damage to the source varies from moderate, to heavy, up to severe. The always superlative Criterion liner notes indicate the original negative was lost, this disc sourced from a 1942 nitrate negative, the best available source in their opinion. It’s not hard to believe. Yes, the amount of scratches can be a distraction, the vertical line right through the credits almost the worst of it. It’s when you consider what’s not here, which includes jitter, flicker, or dropped frames (only one was noted, that was during the opening credits), that you realize how superb this looks all things considered. Grain is finely resolved, thick but never a problem in terms of digital compression. The encode never falters, keeping this free of any digital sequences. Any restoration work is out of view, where it should be. The gray scale is spectacular, and rich black levels keep the deep shadows alive. Heavy silhouetting is used in a few scenes for effect, and blacks are as pure as they come. A few brief shots seem to exaggerate this effect, one at 17:30 immensely bright, but things quickly return to their usual, near perfect state. Behind the grain and damage lies some immense detail, the highlights of this restoration being any shot of Monument Valley. Those wide pans, pushed into the proper 1.37:1 frame, are jaw-dropping in their detail. Rocks, various plants, and any human characters are in plain sight, the slight level of softness not deteriorating any of these views. The frame is deep too, defining not only those objects close. Even things in the furthest reaches of the frame are crisp. The style of the era doesn’t necessarily dictate a high level of close-ups, although a famous zoom on John Wayne produces one of the best in the film at 18:47. The level of precision detail is nearly modern, pores, cloth, and any patterns completely resolved. Even in the usual mid-range, everything is firm, shots of stagecoach presenting its distinct detailing, while the costumes can be appreciated in full. In all honesty, the audio is probably a hair more impressive than the video. This is a PCM mono mix, a gloriously clean affair which only carries the fault of a slight hiss running under the dialogue. If that’s what it took to preserve the score with this much fidelity, so be it. Gerard Carbonara’s score is a beautiful piece of work, carrying with it two distinct flavors, one that suits the adventure portion, and one that elicits danger as the Indians approach. Both are equally flawless here. To be clear, there is a slightly metallic, rough quality to the proceedings. These are not “perfect” themes in the strictest sense. What they are though is pitch (near) perfect, the horns hitting those high notes with simply awe-inspiring fidelity. It adds such a majesty to the scenery, making the score almost transparent to a modern viewer. You can’t forget it’s there, just appreciate its beauty without worrying about any nagging technical issues. Amidst the action, the rapidly paced music keeps hold, audible over screaming, yelping, and horses running across these plains. Dialogue, with that slightly scratchy quality as it may be, never loses any sense of crispness to its age. If anything says it all about this audio track, it’s the power behind it. Even as a meager mono mix, it still has the ability to fill the room, producing an effect that is immense and strong. The audio doesn’t need a low-end or any surround bleed; the music takes care of that on its own, and this uncompressed effort only aids it. A commentary kicks off a fabulous array of extras, this track from Western expert Jim Kitses. A 1917 silent directed by John Ford called Bucking Broadway is included in full, with a catchy score from Donald Sosin. A 1968 interview with John Ford runs well over an hour, and proves intriguing from the start when he states he doesn’t even care for movies that much. John Ford’s biographer Peter Bogdanovich has his own featurette, an appreciation for the film. Dreaming of Jeanie is a video essay on the style used by Ford, followed by a selection of John Ford’s home movies. True West is a piece on Harry Goulding who discovered the location for Ford. Yamika Canutt is a fine piece on the famous stuntman, trailed by the radio adaptation of the film and trailer.